Editor’s note: The original version of this post was published on September 21, 2011. What you said is true, words have meaning. All words have meaning, but some words are more meaningful, depending on who you’re talking to. You hit the nail on the head Brian when you said: “Depending on who you’re talking to.” It is much easier to write copy when you know specifically who the reader is. When you know about them, and their wants and fears, you can be laser-beam specific on what you write. Start with knowing the reader, and the process becomes a lot easier. Great post, the first thing I think of is smell-a-vision. lol. Your words must engage the readers emotions and senses. I agree completely with what you are saying, but I sometimes find your advice intimidating (but still truthful)! “A headline that doesn’t specifically convey a compelling promise results in content that is too often simply ignored. I believe that to all be true, but it has in the past made me feel like writing good content is impossible. What I learned over time, and what I hope others realise, is that you cannot be expected to produce perfect copy from day one. It isn’t a case of “if you can’t nail it with your first ever article, you are doomed”, more a case of “practice makes perfect”. I know where you’re coming from, Tom. As you get better and better, you’ll see better results. But yeah, you’re not going to just read the advice and instantly be able to perfectly implement it. 🙂 I like Martha Beck’s quote, “If anything is worth doing, it is worth doing it badly.” And of course, the more we do, the better it gets. Not trying to be intimidating, but I think sugar-coating reality does more of a a disservice to the new writer. Also, in between these matter-of-fact tutorial posts, I’m always encouraging everyone to keep writing and then write some more. No one is close to perfect, ever — not me, not Sonia, not Stephen King and certainly not a new writer. But I do know that the more I write, the better I get at it. Thanks for the comment. You’ve pointed out the truth about practice in a very useful context. Paraphrased or not, that’s an awesome way to look at it. Boring doesn’t count. This is a great analogy, thanks for sharing it! Totally agree Brian. The words need to paint a vivid enough picture we can’t ignore. One of the things I’ve always noticed is the tendency by marketers to use food references to sell everything from lipstick to house paint. (Look at the names of all those colors!) It’s a metaphor that we all GET. I think the popcorn statistics are a great example of how to make facts interesting. I’ve found that a lot of B2B companies don’t know how to turn data into something interesting and entertaining to read for their audiences. It is possible, you just have to think outside the box! The surprising comparison that Silverman used is an excellent technique. I also write mostly for B2B (in the tech sector), and SO much of the content is dry, technical, verbose. I think I’ll interject some popcorn into my next White Paper and see how it’s received. Thank you. Thankyouthankyouthankyou. I’ve written 300 posts, 2.5 books, countless emails, copy, websites, reviews, etc. – I’m talkin’ seriously prolific – and I have never seen things in this light. Every word written in this post is so very true Brian! I couldn’t agree more that ‘content IS king’ , though how you package and portray the whole package of a post is what really matters. To grab the attention of the readers, with so many blog posts around, is what makes you a real blogger. Being able to leave it overnight and edit the next day helps me a lot with that. I love those big, complex sentences as well. Beyond that, your copy has to hold that precious attention, sentence by sentence, until the conclusion. These 3 sentences are so simple yet hold so much information and value! I think I’m now having pasta for dinner! 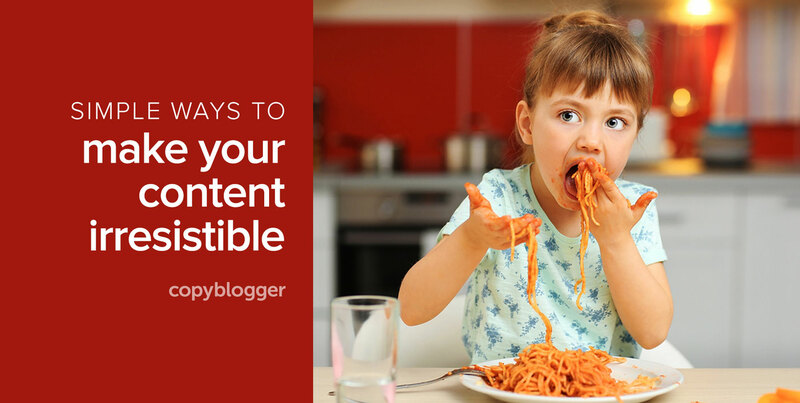 That’s what I love about the articles here at Copyblogger. Each author finds a unique and compelling way to make a teaching point. The factual points have merit, but only once someone breathes life into them do they resonate and become memorable. I totally agree with you Brian. The way a writer conveys her words matter a lot. You have to write in simple language that a complete beginner will be able to understand. It is not really about what you say, it is more of how you say what you say. The more juicy you make it the more your readers connect to what you have to say. But don’t try to be too clever just for the sake of try to make your writing real. as always Brian, your succinctness makes every one of your posts meaningful and valuable to writers from all walks. But with all this talk about food, I’ve got to go pop me some corn and think about dinner tonight! Great post Brian. As a writer, it is as refreshing as standing under a waterfall on a 90 degree day to receive positive reinforcement on the power of one’s words – written or spoken. Let’s cultivate more of that – like a garden of green leafy vegetables resplendent with the red orbs known as ripe tomatoes. The ripe tomatoes represents “succulent speech or writing patterns.” Metaphors aside, I often write for fundraisers – with the challenge of turning a capital campaign into “digestible” pieces of exciting improvements (programs, facilities, research, etc.) that donors can envision and support. For nonprofits (and many other organizations or companies), it’s all about telling the story in a way that makes you think, makes you remember and, hopefully, makes you take action. Appreciate the feedback Sonia. Thousands of poets and fiction writers would agree with you, Brian. Anyone who has ever taken a college creative writing course has heard the old saw, “Show, don’t tell!” The idea being that the writer should tap sensory expression and use imagery — give the reader visuals — preferably through the use of strong verbs as opposed to adjectives and adverbs. You can say: Do you remember when Michael Jackson’s hair caught fire? Boy, was that a juicy bit of news. Or you can say: Remember when Michael Jackson’s hair caught fire and then burned its way through the news like wildfire? One simply tells — it reminds the reader of the event. With its final image, the other shows — it evokes the urgency and excitement of the original story. For me this sort of creative stretching makes writing fun. Though I’m quickly bored with pretty much anything once I master it, I never grow tired of honing my craft as a writer. Maybe because I will never be satisfied that I’ve mastered it. But if you insist that I write in a canned voice that sounds more like a telegram than an inspired human being? Deadening drudgery! Really. It’s spirit killing. Though I know it does intimidate people, working at writing well need not intimidate anyone. Everyone gets to begin at the beginning. You wouldn’t pick up a violin for the first time, pull the bow across it, and expect to play like a concert soloist. But for some reason, people think that they should use written expression like a pro right from the get go. But realistically speaking? Picking up the pen and putting it to paper is really only the equivalent of picking up the violin. Cut yourself some slack — give yourself permission to practice. Words have power. If you doubt it, go to a corpse and say you’re responsible for the death. It’s certain you will be killed too. When marketing online, we should choose our words wisely, it’s the parallel line between engaging readers and putting them off. I had a post I started about people aren’t buying products anymore, they’re buying into the person who’s selling them. In essence, if you sell cars, I’m only going to buy from you if I trust you and/or like your way of doing business. It requires less effort because I know I’m not going to get scammed, and you’ll probably know a lot about me, like #1 – I am not spending more than one hour in this dealership, can’t get it done I’ll go somewhere that can. I want to associate myself with like minded people, forward thinking, who want to think big, take huge risks, move mountains, and not muddle around wondering why nothing good ever happens. I also like people who can express their ideas without hesitation, or trying to perfect everything. I want to find more people who think like me, and so I write exactly that way. Intellectually I can understand the concept and yet there continues to be a disconnect for me when it comes to application. Case in point: my titles are weak and a source of frustration. I recognize that I have a problem, getting readers to read my posts due to lack of craft in my titles. It takes time and as I write and get more experience, I notice what works and what doesn’t. There are no real shortcuts, just hard work through daily writing and tweaking and assessment. After years of reading Copyblogger I’m getting to the point where I can read a headline in my Google Reader and think …. yep, that’s Brian. I like that , Derek! Very Well said “half Full or half Empty” is the classical example of your story. It the presentation that matter now a days, Ingredients/information is available everywhere. Interesting that you brought up Made to STick. I was just rereading it the other day and thinking about how vague we are sometimes with what our blogs are about. When people use to ask me what I wrote about I used to say “self help, self improvement, goals, and that kind of stuff.” It was really vague and not exactly something that would stick. When people ask me now I say “the things you should have learned in school but never did.” One of my personal measures of stickiness has become if I tell somebody will it be easy enough for them to remember so they can tell somebody else. in MADE to Stick, they refer to this as Identifying your Core. If you can do that and let your content be driven by that then I think you’re able to make your writing real. Great insights. Words are so important. Of course they are, blogging is a writing medium, mind you alot of bloggers now put out video posts. Your writing is always so crisp, and easy to read. I think as bloggers we improve over time, like a good wine. When i read back over my original blog posts almost 2 years old now, i cringe and think, ‘Boy i’ve come on a bit since then’. I’ve got a long way to go, before i get to your standards, but am making progress. Thank you for another great post. If you cannot make someone feel, or think they will have no reason to come back to your blog no matter what you write about. I keep saying it because it is simple but true, my best posts strike an emotional chord with my readers. The first time it happened it was over a very simple post that I wrote about my son. My love for him came across and that was what readers connected with. MAKE the reader care. Give them a reason to keep reading. That is why word choice is so important. Thank you as always for another great post Brian. I think this post will ring true to anyone who took creative writing classes in school. The color of words is what will make or break you. For all of us who decided to sit that class out, we have work to do. Practice makes perfect, as long as the practice is very deliberate and focused. Liking the “food description” example, I guess we can all take queue from those, if words can LITERALLY make something sound appetizing, then… well, I think everybody understands their power. Thanks for the nice and valuable information. It’s a challenge for me to write captivating content. You gave me a glimpse of what I can do to change my writing. Really enjoyed the post — as we do all of the content at Copyblogger. As film and TV producers, we find a lot of wisdom from your blog that translates to our world. In our newsletter we recently told filmmakers Copyblogger is just as important to read as McKee’s STORY and Vogler’s THE WRITER’S JOURNEY. A post like this one gets right to the heart of the matter — make you s*** real or no one will care. Thanks for all you do. I wonder if this is the same thing as one’s “writing voice”, something that I always mention and work on my for myself in my writing and story-telling. It is what makes the style unique to that writer so that if you do not know beforehand, you will know immediately who wrote the piece by reading the writing. How you say it adds everything from making it memorable to also going a long way in having a healthy conversation (around confrontational topics, like when I posted about the path to happiness without children! ;)). Yep, can’t agree more. Thank you Brian (and Sonia) for excellent tips here. My connection point between your post and what I am writing as content is “wine”. I am not writing about wine – but I remember always listening very carefully to the descriptions when a “fancy wine connoisseur” talks about it. It is not “hey, this is red wine” – It’s always loaded with expandable terms – “rich, undertones, earthy, etc… ” I get it.. The most important bit I get from this is knowing who you are writing to, knowing your market, knowing your niche. It makes your writing pop. (no pun intended) I personally see all the ‘how to’ bloggers fading away soon. Nobody wants to read all that dribble. My writing is an odd mixture of nostalgia and business history, and one of my (many) goals for it is to “not sound like Wikipedia”. I’ve found that by emphasizing the dramatic side, the human side of things, it resonates so much more with my readers. Great note here, as our words either inspire folks or elicit no real effect. No in between. Real writing moves people into action. Real writers learn how to use words to make people feel a certain way, to move into specific actions. Add details to your message: power verbs, colorful adjectives, all that good stuff. We seek not to convey a message, but to make folks act on the message we offer. Very true! I put myself in the seat of a reader and well – we can feel which content is real for us to read and digest. And then we make a way to entertain our readers and give them as much point as possible – as if we are reading our own story. It’s difficult hearing that how I write some matters, too. I just want to put out the best information, and forget about the “marketing” of it. Also, as the expert in my topic, I get more excited about how amazing the information is, and sometimes a little too excited about minutia. So, I run into situations where I’ll write about a study on the psychology of networking, and for the life of me I can’t figure out how to make a juicy headline out of that. I think it’s important to also remember that “meaningful” depends on who you are talking to. Even more important than how you say it is to whom you say it. 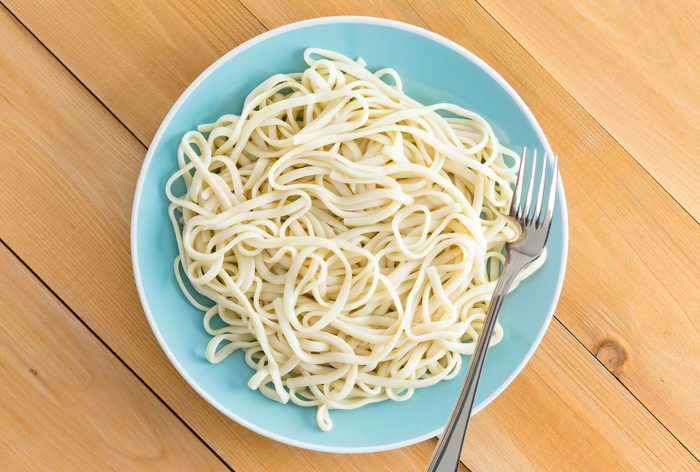 Talk about bland pasta to someone who just ate and there’s not too much that’s meaningful there. 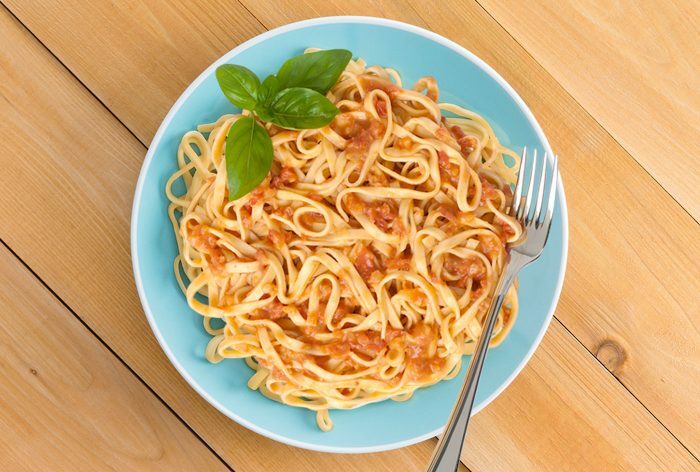 But mention the word pasta to someone who hasn’t eaten in 14 days and that one word is guaranteed to get a big response. I agree with what he is saying about content, and how it is the line between success and failure. Great read – thank you for this post Brian. I absolutely love the way you explained the pasta and popcorn deal. By adding a description to a delicious meal it sounds amazing when you think about it! But, by adding a description to fatty meals or snacks, it definitely makes the person think first before actually accepting. I think this may work for many people who are not aware of what types of things go into food, but are aware of their weight and such. I loved the why you made it short: “How you say it is what you say.” This is what I’ve experienced in everyday life. As a tour guide, it matters to me how to say something otherwise people are bored and I’ll be lecturing to the wall. So, for me it’s a matter of success and failure as you mentioned. Thanks for sharing this fact. Quite true, and also important, because if your writing isn’t real, nobody will read it. Imagine they’re about to run away from their computer the second your content gets dull. I couldn’t agree mores, and it underscores that old writing chestnut: Talk about the benefits, not the features. This is valuable info. I think deep down a lot of writers want their readers to simply love their brilliant writing, and hang on every word, but it’s not enough. There are too many other distractions. Writing an amazing piece is still the most important element, but first you have to grab their attention with the headline, then inject some personality to make them want to keep reading. Even though some may have heard this before, it’s easy to forget, and definitely helpful to be reminded that while being a great writer is important, so is good salesmanship and marketing your articles for maximum impact. And in the end, spicing up the way you word things also makes the article BETTER, so it’s a win-win! Great article Brian! This really hit home with me. I will take this to heart and implement it! Thanks Brian. Brian, I was surprised that you didn’t spell out all the words in the post using the pasta—that would have been real (plus sauce). Really though, great stuff here, well-seasoned. Inspirational message. It’s hard to argue that the way you present an idea is as crucial to how it’s going to stick or not. I’m loving the popcorn example. Saying how many grams of sugar fat there is in it is much less appealing than comparing it to other foods that we can visualise. Actually I’m going to see the premiere of Suicidal Squad today… and yes, I’ll skip out on the popcorn too! You just nailed the ‘In short, how you say it is what you say’ idea. Yet, again, a meaningful, actionable content from your end. Thanks for sharing some “real” examples. They have made reading and understanding your information easier, and definitely memorable. One of the problems that I face while writing content for various websites is that I struggle to keep my information tangible and easy-to-digest. Another one that face is to keep my sentences short and simple. Do you have any tip up your sleeves that can save me from writing complex sentences? Thank you. Great article! Reading about common things and get to know something new about them attracts more attention. Good examples! After reading your post i started feeling hungry! Great Post though thanks for sharing! Great advice! I love the way you describe things in such great detail, it really hammered home your points. Plus, it made me hungry for lunch. Thanks! Hey, just was browsing through the internet and found this article. It often happens with me as well as many bloggers who face this issue of making the writing real and more broader to help the users as well as make it more descriptive to increase the engagement rate. But really amazing writing you did though 😉 Thanks for this article. Thanks Brain, for the specific point you focused on content writing. I also do believe that content should be tangible & realistic/meaningful. It should be helpful to the readers. On a tangential level, I love how the re-post helps me consume most of the Copyblogger post without having to dig for it. Adding detailing to the topic, the way to emphasize and describes it makes all the difference to the reader/buyer. I once wrote the description for a shopping website and I used the detailing of the product to make it appealing. It was pure out of desperation because I was told to write 100 to 200 words description for a dress which looked like a simple dress. That challenged me to write about the feel of the cloth, occasions when one can wear it, the color and the mood in which you can rock it. It made write an engaging content with meaningful words. Loved Brian, you rock. Stay Awesome. You’re right content that grab audience attention is mostly liked by everyone. So getting good content is not enough but content must convey the information audience are seeking. Wow. This definitely put it into perspective. And yes, words have so much weight on them. How you describe something can truly make an impact. That’s why it’s so important to know your target audience and add a little pizzazz. I will try to implement those tips on my blog. I’m new and this will definitely help me. Many thanks. I’ve also found adding other senses, sight, touch, smell, etc enhances the story. Simple is simply the simple. Most talks are way too simple. But once we need something to get noticed by the listeners and readers, we need to spice it up. I won’t say to add the spice of lie but become real and genuine. Add your own perception about what you’re talking about. Express your inner feeling about the topic and I tell you it will be worth it. We’ve just started implementing and experimenting with these idea – can’t wait to to review the outcome. This post make me hungry, hungry for food and for writing). Thanks Brian! Hi, It is really helpful article, the examples of popcorn and pasta are really giving the exact meaning of the blog. Very nicely put. “How you say it is what you say it.” Indeed!